WordPress Dot Com Vs WordPress Dot Org: What’s the Difference? 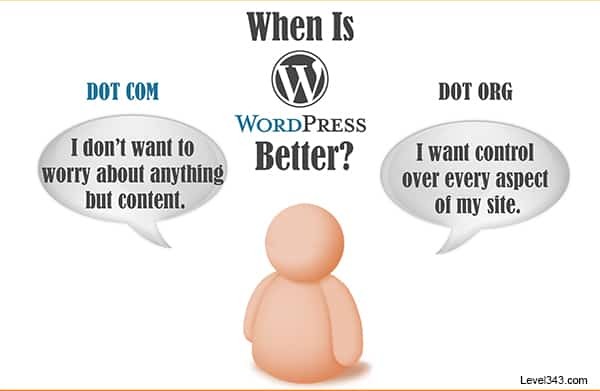 Home/Online Marketing/WordPress/WordPress Dot Com Vs WordPress Dot Org: What’s the Difference? Today, we’re going to answer an “age-old” question: WordPress Dot Com Vs WordPress Dot Org – What’s the difference? We’re talking comprehensive information here. And pictures. And comprehensive information in pictures. WordPress is one of the top platforms used today. It’s so popular, that many business owners and casual bloggers alike are switching from “average” HTML sites to the WordPress content management system (CMS). In fact, WP as a whole runs 25% of the sites that are on a known CMS. [tweetthis]There’s a .com and there’s a .org, and – even though they’re built by the same guys -[/tweetthis] there’s a big difference between the two. How do you know which one you need? You’re free to take this image and use it on your site – even if you’re a competitor. We’re okay with that; competition is healthy. However, we do require a link back to this page. And you can’t change anything about the infographic, like take our logo off or anything. Not that you would of course, but… lawyers. You know how it is. WordPress Dot Com Vs WordPress Dot Org: What's the Difference?